Easter is almost upon us and that means "Let's decorate some eggs"! You can buy those little plastic sleeves that you shrink wrap around your egg for that "perfect look" but how absolutely generic. Egg dyes, stickers, pompoms, and glitter whahoo; that's what little eggs are made of! Those eggs may not be perfect but they are yours... or your child's. To get in the mood put on some music such as this late 50's or early 60's vinyl record. 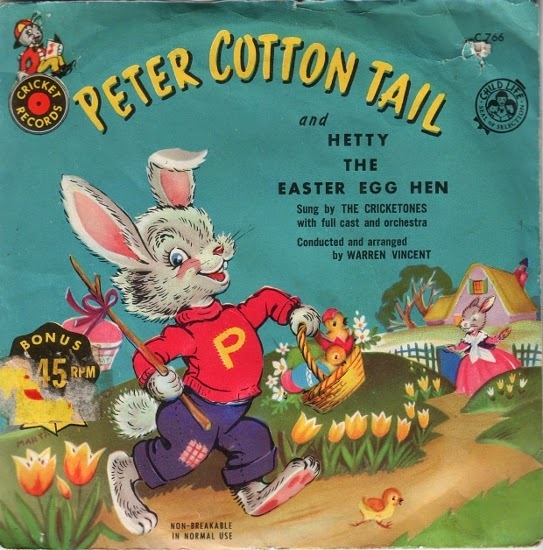 "Here comes Peter Cottontail", dip those eggs, "hopping down the bunny trail", add some glitter, "hippity, hoppity, Easter's on its way". 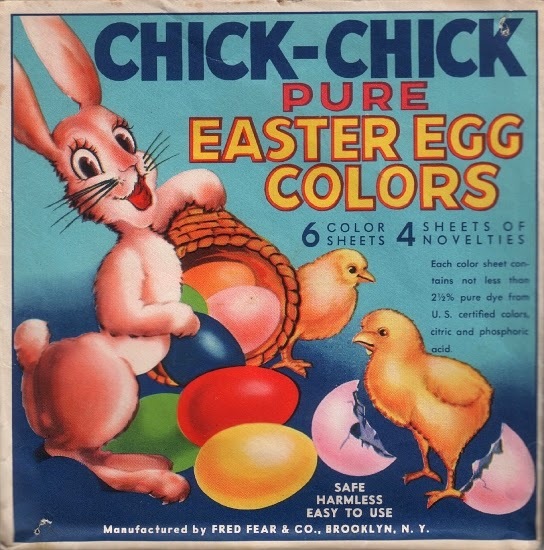 Not all of these Easter egg dye packets are old. Some of them are from when our kids were small, but I liked the packaging, so I either kept the package or bought an extra one for myself. Both of these Braun dye packets are European and are from the late 80's or early 90's. 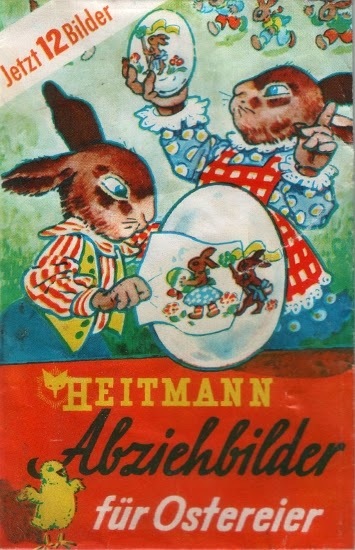 The European package illustrations are so much more interesting than the contemporary North American illustrations. 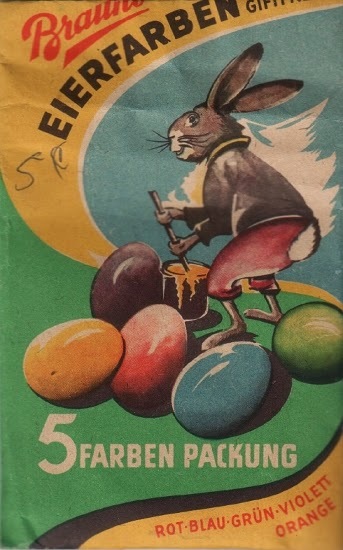 There were food colour transfers and decals to decorate your eggs included with the egg dyes in this 1960's packet. 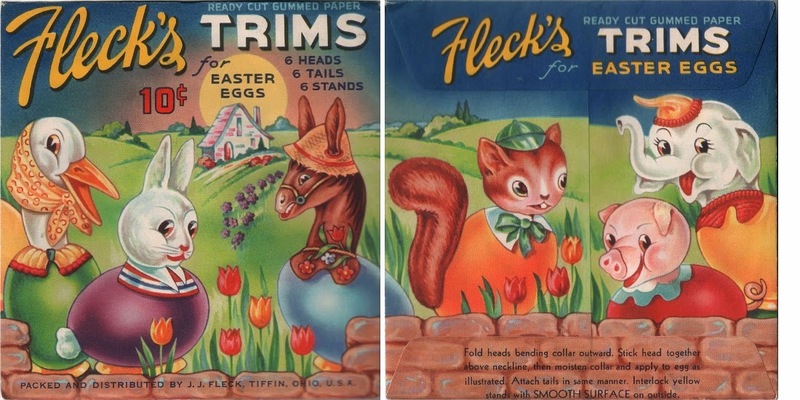 Fleck's egg dyes had wonderful full colour illustrations on their packaging. They also had small stickers that you cut out and stuck onto the egg to create the characters illustrated on the outside of the package. The back and front of this Fleck's dye package is absolutely delightful. These stickers are inside to create the characters shown. I know someone out there is saying "What's the difference between a modern shrink wrapper for an egg and one of these characters for your dyed egg". I guess not a lot, but you can put it on the egg anywhere you like. A child's attempt at achieving the exact same look will be stamped with that child's personality not the perfection of infallible modern technology. 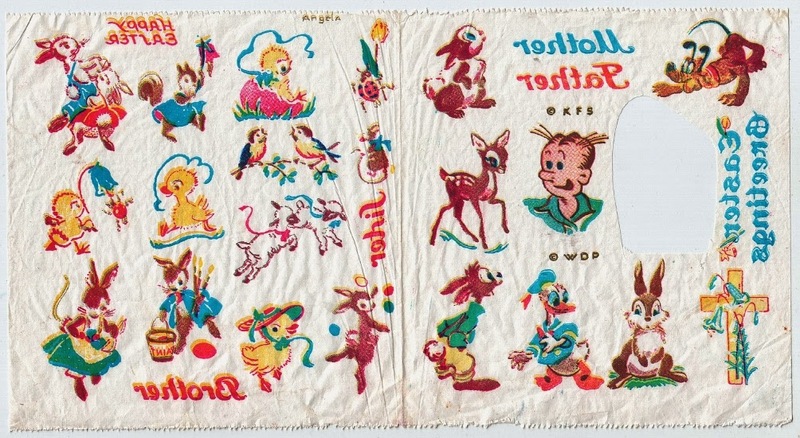 There were twelve transfers in this package to decorate your dyed or plain eggs. 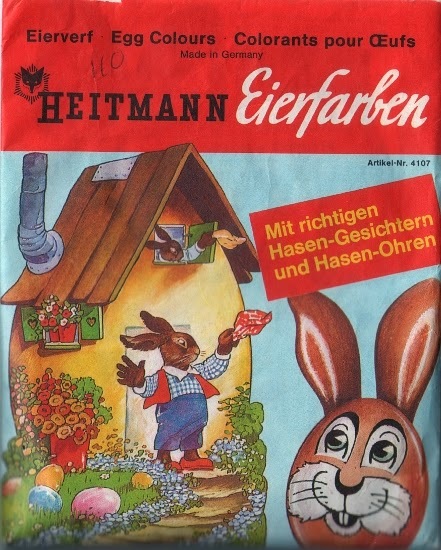 The transfer was soaked in water for one minute and then slid off of the paper onto the egg and would be used in conjunction with the following Heitmann egg dyes. 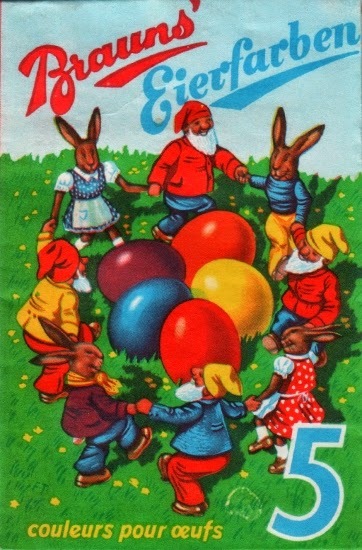 This package of egg decorating supplies has four sets of rabbit face transfers, four pairs of paper ears to cut out to add onto your eggs, and five colours of dye. 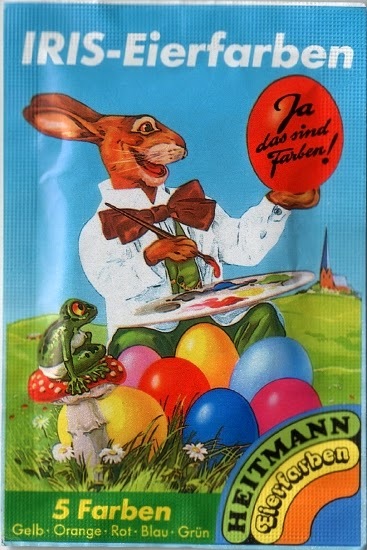 Heitmann produces egg dye sold under the name of Iris if you wish to just dye eggs and not use transfers or if you are on a budget. 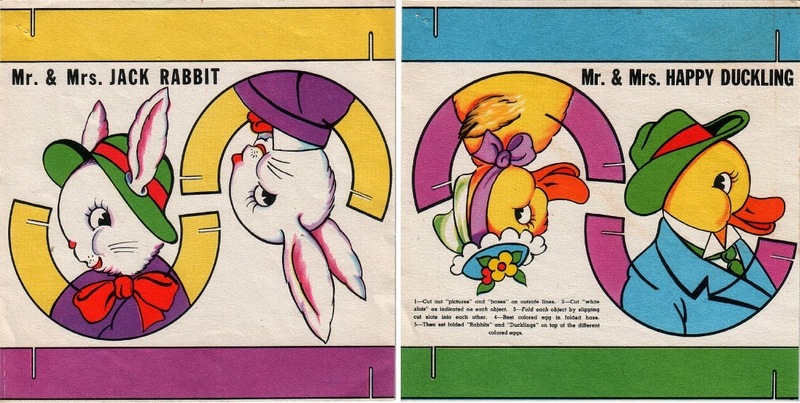 These pages of punch out images were ready to wrap around your dyed eggs. They were then ready go on the table as part of the Easter decorations. 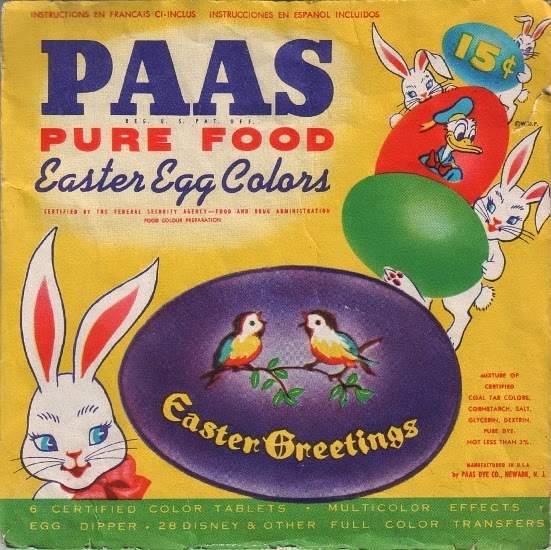 Paas egg decorating kits had six different colours of dye, an egg dipper, and twenty eight transfers. 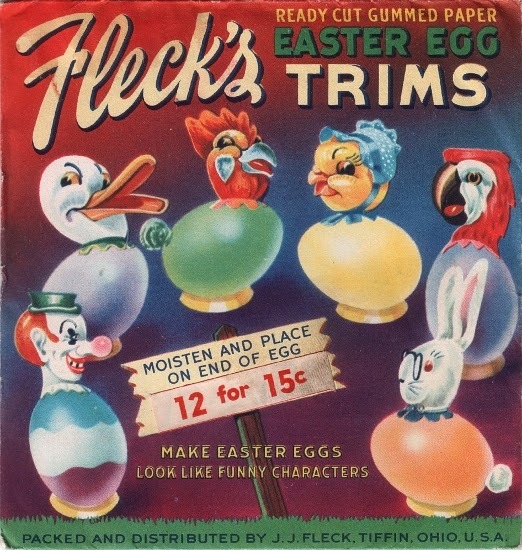 I have no idea what egg decorating kit these came with but the images look like they could be 1930's or 1940's. I debated about including all of these dye transfers but I figured that they may inspire someone out there for a project or design. Let me know if they have been useful. 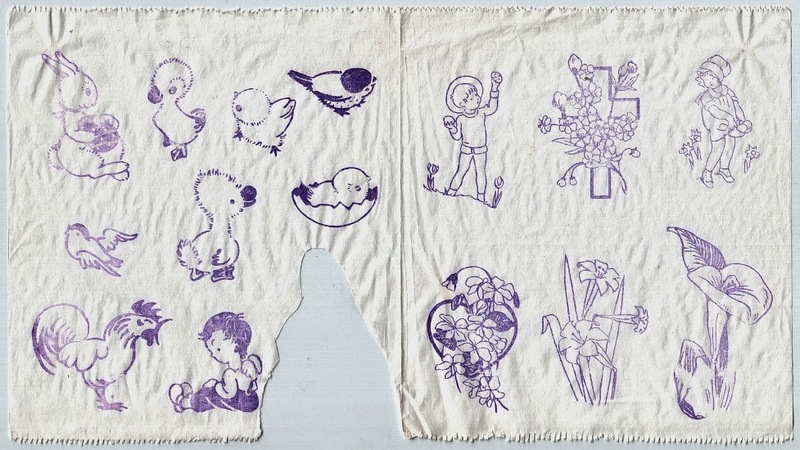 The designs are printed in dye on tissue paper. they are cut out individually applied to the egg and then a damp cloth dipped into a vinegar and water solution is wrapped around the egg to transfer the design to the egg. The images are quite charming. To get a better look at them just click on each picture. Thanks, I hope they inspire you. These vintage images are darling - I never knew such items existed - thanks Len! There's nothing like the Iris dyes from Heitman Deco! They give such deep colours. I wish they had transfers like these around now days.